Shin splints. Ever had them ? I have. When I was about fifteen, sixteen I played soccer. In the winters we could not train on grass and shifted to a hard gravel field. They always hit me then. I knew it was the change of terrain which did it to me. Too much pressure on the lower legs for me. Shin splints are painful and they can really mess up your running training schedule. 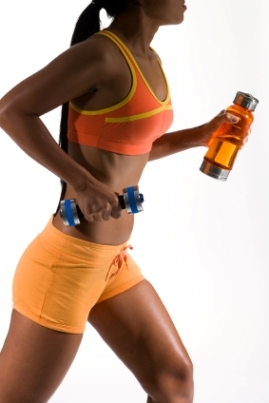 Once you have them it can easily take more than six weeks to get back to normal running again. Thats why I want you to know how to treat shin splints. But Id prefer if youd prevent them ! So please read on. This is important stuff. What can you find in this section ? Which runners get shin splints ? What causes shin splints ? Shin splints, what are they ? They usually start out as little annoying pains on the shins at the beginning of your workout. But during your workout, they go away. The next workout they are back for a bit longer. And every workout after that, they are back for a while longer. Until you have the pains constantly. It is not so strange we runners develop this running injury. Our lower legs take the impact of two to three times our body weight every time we take a step while running. Each leg does about ninety steps a minute. Thats a lot of impact on your lower legs ! does the phrase too much, too soon ring any bells ? Runners who suddenly increase their mileage; same thing as for new runners, too much stress on the legs without having the body adjust for it. Runners who change their running terrain to harder or steeper grounds; hmm, sounds like me when I was playing soccer (see opening paragraph). Shoe & foot problems; when you are an overpronator (= flat feet) or your shoes are beyond ready for renewal then you need to be really careful. Those nasty shin splints will be on the look-out for you. Not enough stretching and strengthening; when your achilles heel and your calves are not strong enough then you are likely to have shin problems sooner or later. So, what do you do if you have this lower leg injury? stop running. As with most leg pains, icing your shins is a great first treatment to stop inflammation. Easy icing is possible with Shin Ice, which has cold packs containing cells of purified water. These are sewn inside a neoprene sleeve. You simply refrigerate the sleeve and then slip it on! Dead easy. After icing, the next thing to do is stretch. Stretch your calves (heel raises) and your achilles (heel drops). Also see my achilles tendinitis page for these exercises. These are great strengthening exercises for your lower legs and should be part of your training program. Other good exercises are walking on your toes and walking on your heels. Just do them now for a few seconds. You immediately feel which areas they stretch and you know why these exercises will be good for you. Stretch daily. Stretch a couple of times a day. Making your lower legs stronger is the key to fighting and preventing shin splints. 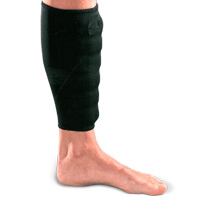 The shin splint from Pro-Tec works as a support to your shins. 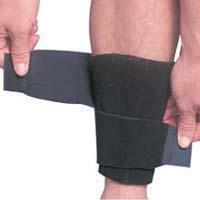 It helps to reduce the symptoms of shin splints and it adds stability by providing gentle pressure. This also helps to stop additional tearing of soft tissue. Whilst injured, look at cross-training possibilities you can do to maintain fitness like riding your bike and swimming. In the meanwhile go to your favourite running store and have them check your shoes. Are they right for your foot type ? Are they too old and do they need to be replaced ? Do you need insole ? By the way, do me a favour and check my running shoes page if you are not certain yet that your running shoes are important to you. Do it. They are the single most important part of your running gear. When you get back to running be really careful. Small increases are what you want here. No crazy stuff. With the amount of impact that your lower legs take, anyone, you too, can get shin splints. You can try to prevent them by doing the stretching and strengthening exercises as described above. Along with a sound running program which focuses on gradual mileage increases, enough rest in between and of course, with the proper running shoes, you do about everything right. I am not saying you will prevent shin splints then. Maybe you are very susceptible to them. But one thing is for certain: it is a good way to strengthen your lower legs and to decrease your chances of getting a whole range of lower leg injuries. Read more now about increasing mileage safely. 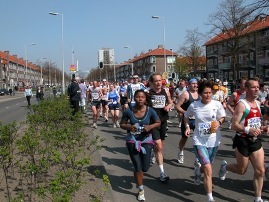 Read more about running shoes. Read more about running stretches. Check out Shin Ice and the shin splint compression wrap. Wish to know more about running injuries? Subscribe to the Best Running Tips Newsletter or get an easy subscription to my RSS Feed.